With an infusion of new restaurants comes a whole new crop of chefs, many who are new to the SMA culinary scene. Some have worked with icons like Chef Enrique Olvera and Chef Rick Bayless; still others make the cut with an abundance of natural talent. Many have trained with some of SMA’s best chefs: Matteo Salas, Marco Cruz, Donnie Masterton and Greta Ortega Casanas. Chef Arturo Sandoval of ATRIO was taught how things should taste by his grandfather, Chef Wenseslao Sandoval. Arturo has already raised the bar with his incredible Mexican – Peruvian - Spanish fusion cooking. Chef Mauricio Lara Sarmiento of Belmond Casa Sierra Nevada began his training with the great names of Mexican cuisine: Chef Enrique Olvera in Pujol and Chef Mikel Alonso at Biko. It all began for Chef Paul Bentley of Bovine in his native Australia. Sparked by his inherent curiosity, he began to see the connection and natural coexistence between agricultural production and the sea; an insight that’s become his greatest advantage as a chef. 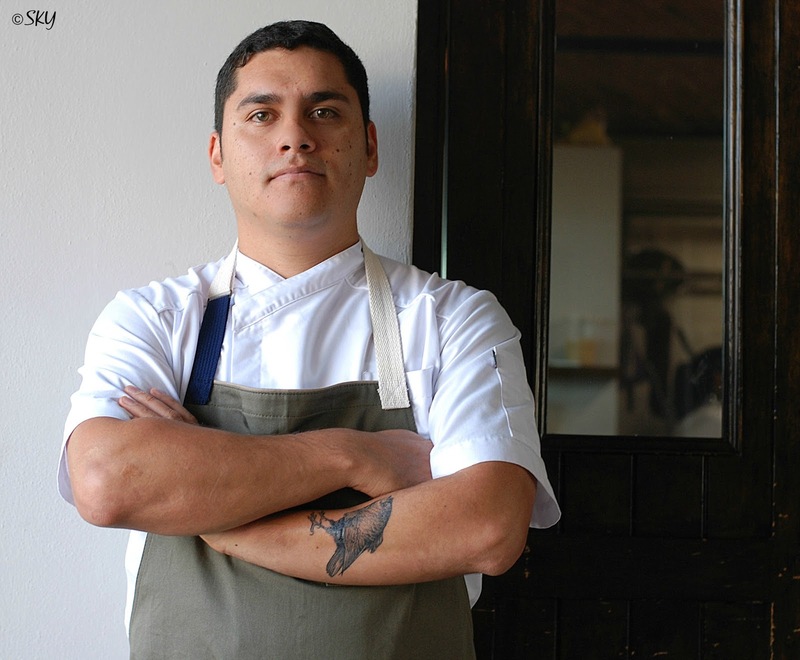 Chef Miguel Nunez of Bovine polished his culinary skills at two 50 Best Restaurants: Restaurante Alcalde in Guadalajara and Corazon de Tierra in Baja California. 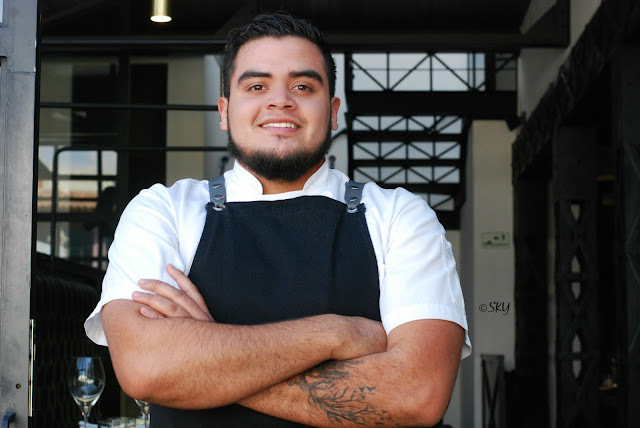 Sous chef Raul Partida of Bovine started working in gastronomy at eighteen; developing his passion for cooking from his mother, Carolina, and grandmother, Socorro. Sous chef Juana Pérez of Buen Viaje went to culinary school through the generosity of two expats: Roslyn Colley and Sharon Segal. She now has the benefit of training with one of SMA’s best chefs, Marco Cruz. Although Chef Stephanie Cerón of B'ui cocina de campo supervises and prepares the entire restaurant menu with her team, her real passion is desserts. Sous chef Irene Palma of B'ui cocina de campo was commissioned for her first position in the kitchen on the grill; today, she’s a master at it. Pantry chef Diana Castillo of B’ui cocina de campo is currently a student at UTSMA and is part of the all female kitchen at the restaurant. 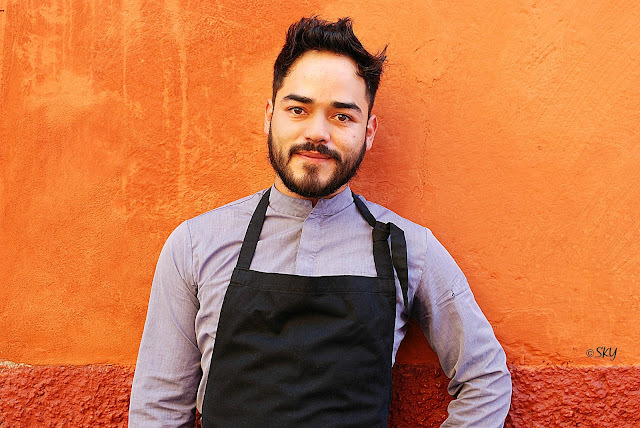 The cooking of Chef Jonathan Cuevas Fuentes of Beelia cocina y cava was influenced by his mother and grandmother, both of them chefs in Mexico City. Chef Juan Jose (J.J.) Castaneda of Fatima studied at the Culinary Institute of America, Greystone in Napa Valley and the California Culinary Academy in San Francisco and trained with chefs Rick Bayless, Michael Mina, Rolland Passot and Donnie Masterton. Gerardo Hernandez Davalos of Hacienda Los Picachos graduated with a Bachelor of Gastronomy from UTSMA SMA and once staged for MiVida chef, Greta Ortega Casanas. Chef Miguel Gallegos Miranda of Mama Mias has taken on an enormous challenge: moving this forty two year old restaurant to a more organic profile. Chef Cesar Garcia of Marchanta Comedor knows all about healthy eating; he was a nutritionist before he started his career as a chef. Sous chef Izacc Montalvo of Marsala cocina con acentos trained with two leading chefs: Juanxo Sánchez, a judge on Top Chef Mexico and Michelin star chef Alejandro Sánchez of the The St. Regis Mexico City. Sous chef Juan Manuel Galvin of Nextia won the 2017 Chef of Guanajuato contest that took place this past August. Although he’s worked with Chef Alonso Dominguez for some time, only his customers knew he was so talented until he won this major award. Sous Chef Grecia Micaela Carrasco Chávez of Nomada Cocina de Interpretacion has the benefit of professional, hands-on training: currently with Chef Marco Cruz and Chef Sofia Antillon at Nomada Cocina de Interpretacion and previously at Restaurante Tabachin, a 4 Diamond restaurant in Acapulco. Chef Xavier Pinero of OCRE was selected by the MAG Gastronomic festival in an elite group of nine up and coming chefs on the rise for his work at his restaurant, Aborigen Cocina Salvaje. Sous chef Daniel Durán García of OCRE trained with some of SMA’s best chefs: Matteo Salas at Áperi and Israel Loyola in Jacinto 1930. He also did a stint with Chef Diego Hernandez Baquedano at Corazón de Tierra before joining Chef Xavier Pinero to open OCRE in 2018. Sous chef Alina Stalone of Panio Atelier Du Pain hails from New York and is a graduate of the Culinary Institute of America in Hyde Park, NY. She trained in farm to fork dining at restaurants in the United States. 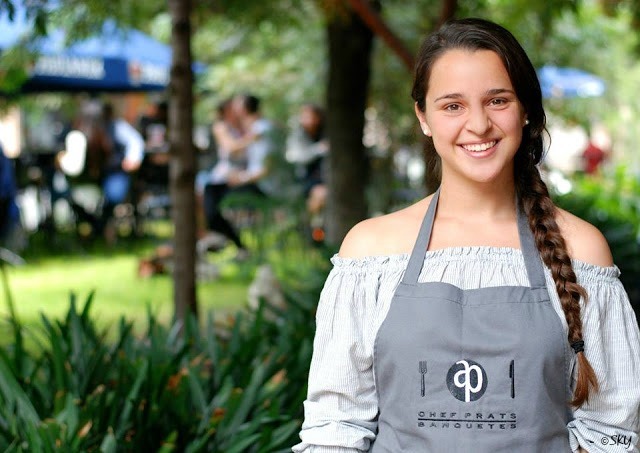 Chef Emilia Prats of Prats Banquetes graduated from Universidad de las Américas Puebla (UDLAP). Pastry is her first love; her goal is to open a bakery. Her father is one of SMA favorite chefs, Armando Prats Leal. 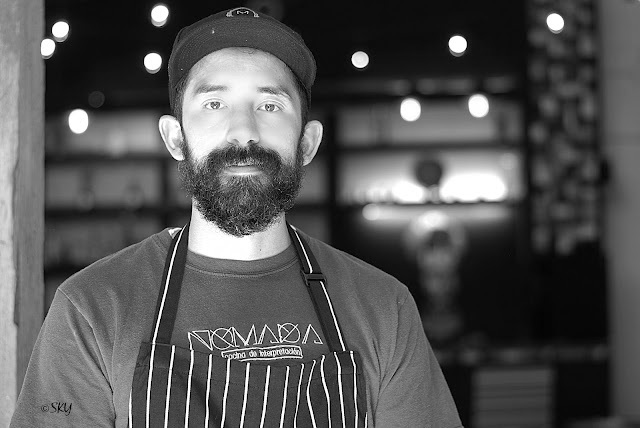 When Birdies Burgers and Taco Lab opened last year, Chef de Cuisine Hugo Velázquez Avila of The Restaurant moved to SMA from Tacolicious in San Francisco. He’ll help out with the opening of Fatima in 2018. Chef Alan Carias of Trazo 1810 graduated from the University of Puebla and polished his culinary skills working at restaurants in the Riviera Maya. His flair for originality is always transparent in his cooking. Pastry Chef Abi Verde of Trazo 1810 worked with international chefs like Benoit Gaillot, Karen Man, Kenny Kuri and Enrique Olvera. She’s one of the young, new pastry chefs to watch in 2018. After working at Aperi, Chef Jesus Vazquez Reyna of Under the Table spent a season at L’Astrance, a three Michelin star restaurant in Paris. Chef Mariana Gonzales Gutierrez of Under the Table started her career as an intern at Pujol when she was just 19 years old. She saw photos of Aperi in an airline magazine and wrote them for a job. They offered her an internship, hiring her full time just three weeks later. All of these chefs are exceptional, marking their path with hard work, passion and a commitment to making San Miguel de Allende one of the best food cities in the world. Stay tuned; we’ll do a follow up article on this group sometime next year. Born in Mexico City, Chef Sandoval loves to travel and is passionate about knowing other cultures through their kitchens. He graduated with a degree in Gastronomy from the IESTUR University (Institute of Higher Studies in Tourism). In his third semester, he had the opportunity to work with Chef Moma at Restaurant Osaka Pedregal in Mexico City, specializing in Peruvian-Japanese Cuisine. 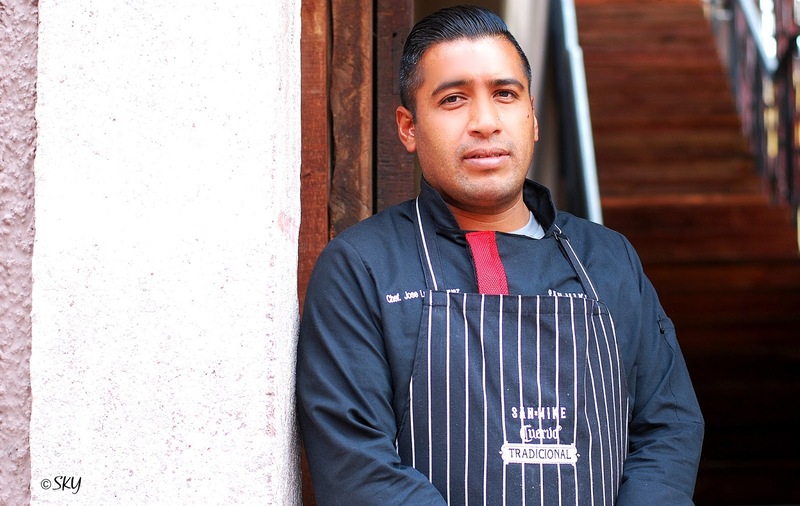 He ultimately became head chef, and then moved to their new branch in Polanco as Sous chef. One year later, he was chef of the unit. As a member of the restaurant group Am Pm Rest, he collaborated on various culinary projects with Chef Moma: La Bocha, Luzia, La Lupe, Cuines,Tomato Bar and Lucy Shanghai. Two years later, he was in charge of opening Ponzu Restaurant in Puebla, Cuernavaca and Polanco. 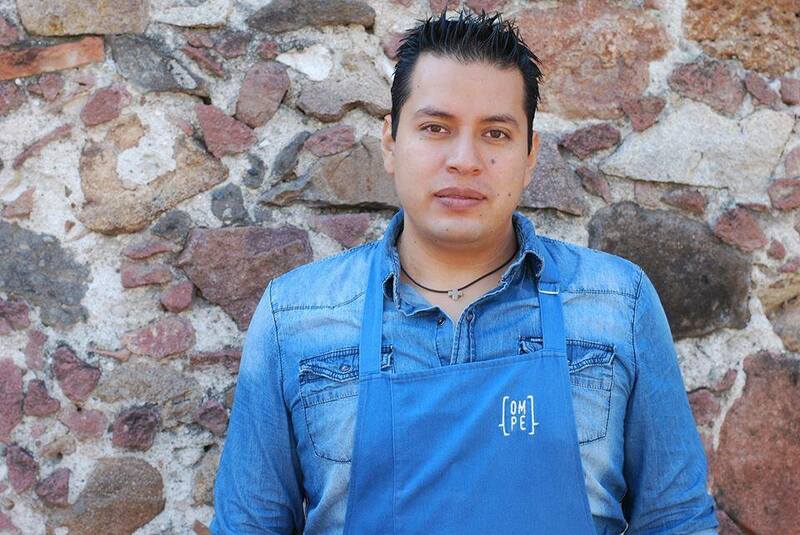 He became the Executive Chef at Ponzu and La Bocha in Puebla. Before he was offered the job at ATRIO, he traveled to Lima, Peru to work with Chef Moma at the Jerónimo Restaurants and at KO Asían Cuisine with Chef Gianfranco. 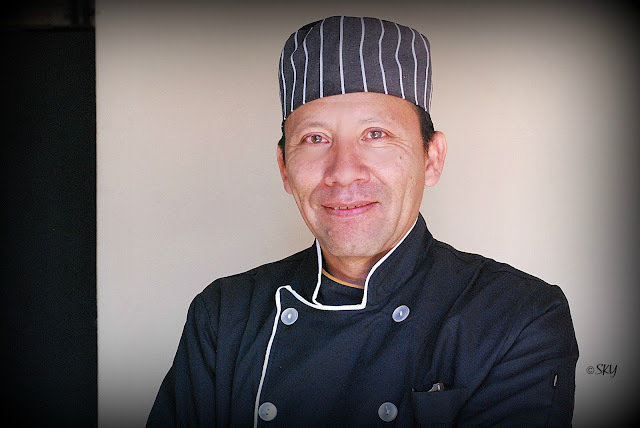 At ATRIO, the seat of his culinary creations, he works with an experienced team to fuse different types of cuisines – mainly Mexican, Peruvian, and Spanish - and is committed to setting the standard for how a restaurant experience should be for ATRIO’s guests. "That was never taught in school," he said. With a long career at Hard Rock, this passionate chef is new to San Miguel de Allende; ready to make his mark with an excellent brand behind him: Belmond Casa Sierra Nevada. Chef Mauricio Lara Sarmiento says that passion, pride and discipline defines the world of gastronomy. Born in Mexico City, his training began with the great names of Mexican cuisine: Enrique Olvera in Pujol and Mikel Alonso in Biko. Eager to make a mark, he started as an Executive Sous chef at the Hard Rock Hotel Rivera Maya, implementing a molecular kitchen and chef's table in the restaurants. 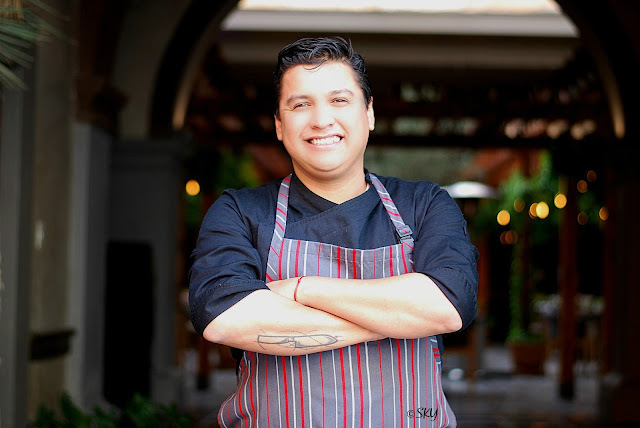 Later, as Executive Chef of Hard Rock Vallarta, he was named the youngest Executive Chef of Hard Rock International for three consecutive years and took first place in satisfaction for Food and Beverage worldwide. He was also the first place winner for dishes and originality for all Rivera Nayarit. He hosted the 8th edition of Vallarta Nayarit Gastronómica with Michelin star legends like Chef Jordi Rocca. He was later named Executive Chef of Hard Rock and Casino Punta Cana. Now at Belmond Casa de Sierra Nevada, he works with Executive Sous chef, Antonio Juarez Arzola, to step up the Mexican tradition with a totally new, fine dining concept. The power of teamwork is mighty in kitchen at Bovine and we think this restaurant has one of the best teams in San Miguel de Allende. 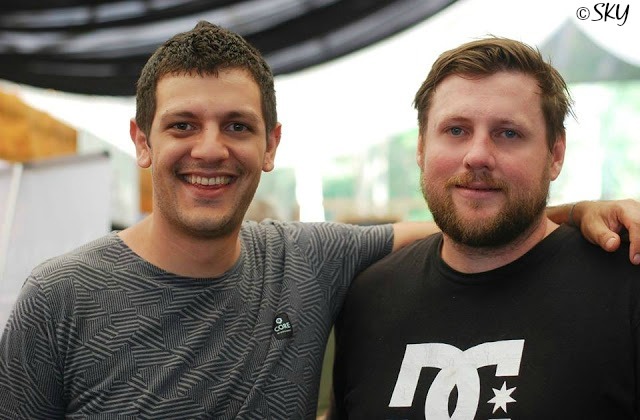 Part of the chef community in SMA even before he opened Bovine with Bruce James, Chef Paul Bentley was a guest chef at Sabores San Miguel back in 2016 and is pictured here with Chef Matteo Salas of Aperi. Cook, baker, pastry chef, entrepreneur, and visionary, Paul Bentley is an Australian with deep passions and values that determined every moment of his culinary journey. 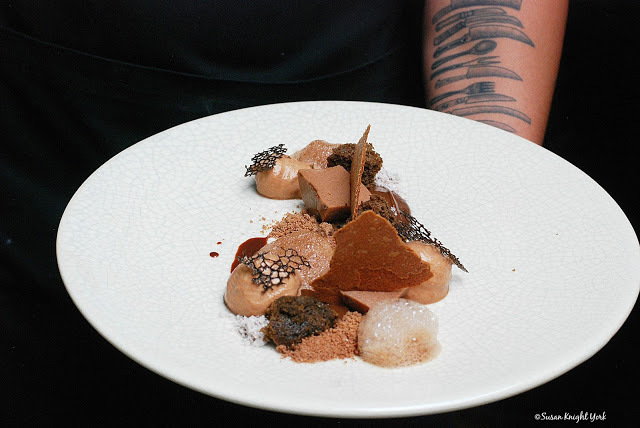 It all began in native southwestern Australia when, sparked by his inherent curiosity, he began to see the connection and natural coexistence between agricultural production and the sea; an understanding that became his greatest asset as a chef. Now, with more than 20 years of experience in gastronomy, he has been part of some of the most acclaimed restaurants in Australia (with Chef Bocuse), Europe and New York as well as Mexico including three Michelin three star restaurants: in France at Pierre Gagnaire, at La Pergola in Rome and at Daniel in New York. In 2015 he opened Magno Brasserie in Guadalajara, which was named the best new restaurant last year byTravel + Leisure magazine. He also has the acclaimed Mi Amor restaurant in Tulum. At seventeen, Chef Miguel Nuñez worked at a coffee bar, Café and CO. He went to work at Rugantino Pizza e vino the following year and at twenty-one, started working in Restaurante Alcalde, one of the 50 Best Restaurants, as a cook and then as Sous chef petit. Miguel’s career took a spike when he became Sous chef at Corazon de Tierra in Baja, a 50 Best Restaurant for four consecutive years. The following year, he returned to Guadalajara to cook with Chef Paul Bentley, who ultimately offered him the position of chef at Bovine. Sous che Raúl Ocaranza Partida is originally from Guadalajara and graduated from the Universidad de la Cienega. He developed a passion for the kitchen from his mother Carolina and grandmother Socorro. Early in his career, he went to work for one of the most famous restaurants in Guadalajara, Restaurante Alcalde, a 50 Best Restaurant, as a cook, ultimately finishing as head of the departure in the hot area. He also did a stint at Restaurant El Pez in Tulum before coming to Bovine. 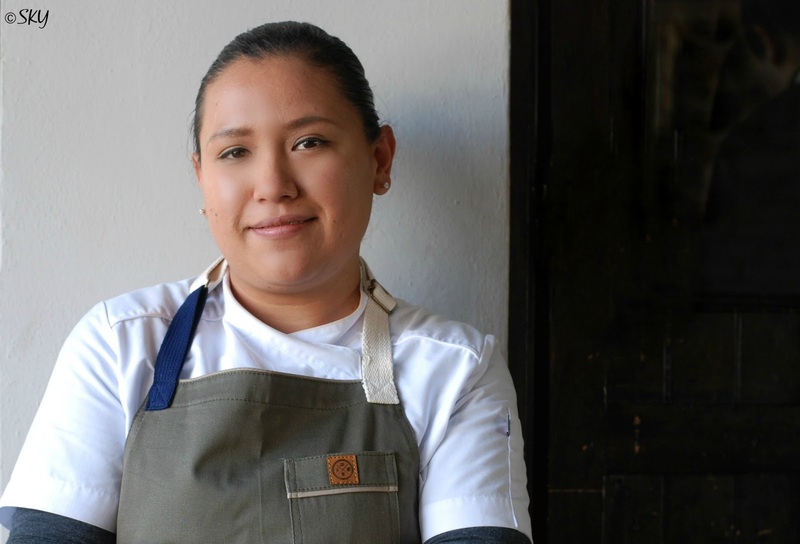 Chef Stephanie Ceron studied at the Coronado gastronomy school in Mexico with her first job at the restaurant-school Root, under Chef Arturo Fernández. She came to B’ui cocina de campo to work as part of the kitchen team and worked at Milpa, also owned by B’ui owner Daniel Estebaranz. Last year, she became the head chef at B’ui. Although she supervises and prepares the entire restaurant menu with her team, her passion is desserts. Sous chef Irene Palma arrived to help open B'ui four years ago. Because of her great interest in growing and participating in different cooking areas, Irene was commissioned as her first position in the kitchen on the grill. We think she’s a master at it now. Pantry Sous chef Diana Castillo is currently a student attending UTSMA and is in charge of all cold items. At B’ui, Stephanie, Irene and Diana make up part of an all female kitchen. A graduate of the California Culinary Academy, San Francisco and the Culinary Institute of America, Greystone in Napa Valley, Ca., he became the face of El Paso Chihuahuas, a minor league baseball team, serving 8,000 – 10,000 people daily and registered on MLB.com with one of the top five ballpark foods in the US. He studied under James Beard Award winning Chef Rick Bayless at Frontera Grill and Topolobampo in Chicago, was Executive Chef at Joe DiMaggio’s Italian Chophouse in San Francisco, Executive Chef at Maria Maria La Cantina in Austin, along with owner- musician Carlos Santana and Corporate Chef Roberto Santibanez. He was the Executive Sous chef for Zibibbo, named as one of the “Best Restaurants in America” by Gourmet Magazine. He worked with Chef Roland Passot and Chef Michael Mina at Aqua, helped Chef Donnie Masterton open Azie in San Francisco and worked side by side with his culinary idols: Julia Child, Paul Bocuse and Nancy Oakes. Hacienda de Guadalupe converted it’s once popular bar and dance floor into a new restaurant, Beélia cocina y cava, with an exciting menu and wine list. Heading up the kitchen there is Mexico City native Chef Jonathan Cuevas Fuentes, who inherited his love of cooking from his mother and grandmother, who were both cooks in Mexico City. He studied gastronomy at the Universidad del Valle de México. After graduation, he started his training in the bakery at Hotel Nikko México and continued his work at the Hotel Sheraton María Isabel, Grupo Anderson, and finally as a kitchen assistant in Au Pied de Cochon with French Chef Yann Michel Cozic. He was also the Executive Chef at Hotel Real de Minas before coming to Hacienda de Guadalupe to open Beélia cocina y cava this year. Born in 1992 in Mexico City, he graduated with a Bachelor of Gastronomy from UTSMA SMA. 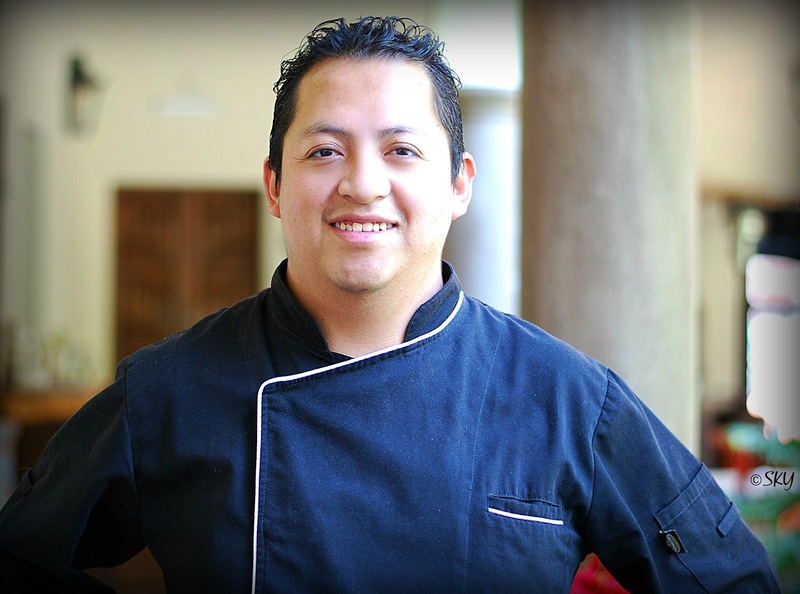 He has five years of experience as a chef: at Hacienda Tres Rios, Sunset World Hotels and Resorts, Riviera Maya Cancun, and Planta Alta Restaurant in Celaya. He also staged at MiVida Restaurant in SMA for Chef Greta Ortega. He's currently the chef at Restaurant YO at Hacienda Los Picachos, forming part of an experienced team of chefs working at the restaurant. Serving 1,000 people each weekend is no easy task but with a staff of fifty four, Chef Miguel Gallegos Miranda makes it look easy. What isn’t simple is the assignment he took on when he was hired: to make Mama Mia’s, one of the oldest and most popular tourist restaurants in SMA, more organic, incorporating food from their organic farm, Rancho Luna, located behind the Sanctuary at Atotonilco. As a child, Miguel never had relatives to teach him about flavors and techniques so he devoured magazines and books, taking cookbooks out of the school library which were later gifted to him. Studying culinary arts at UVM (Universidad del Valle de Mexico), he staged at Le Basilic Cancun with Chef Silvain Desbois and later with Chef Mikel Alonso at Biko. Working at Biko changed his life; it was named in the top 50 Best in the world the year he worked there, which encouraged him to do stints at some of the world’s finest restaurants. 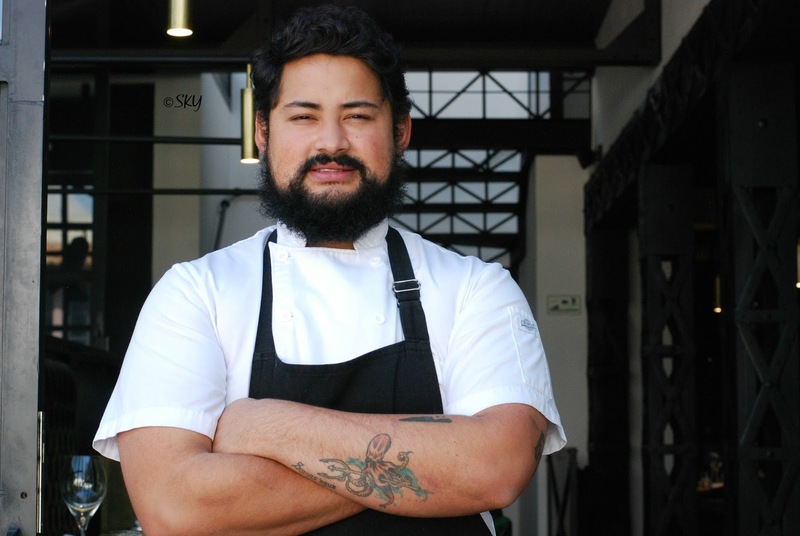 He worked with Chef Margot Janse in Franschhoek, South Africa, at the Tasting Room in Le Quartier Francoise, and at The Test Kitchen with Chef Luke Dale Roberts in Cape Town. Surrounded by vineyards and organic, grazing and free range farms, he learned to respect the products, discovering the proper techniques to emphasize them. In Wolfsburg, Germany, at his first three Michelin star restaurant, Aqua, he worked as part of a creative team with Chef Sven Elverford. He returned to Mexico, and worked as a senior partner and development chef with Chef Daniel Ovadia in Paxia, focusing on contemporary Mexican cuisine. He opened Anatol with Chef Justin Ermini, only to discovered flavor. 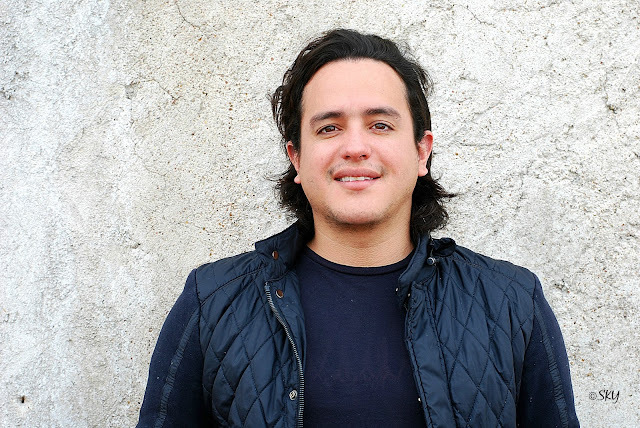 After working for a brief time in the UK, he returned to Mexico and opened Garum with Chef Vicente Torres as Chef de Cuisine and leader of his creative team. He also did a stage with Narisawa and Jimbocho Den in Japan, to learn about Japanese culture, flavors, and discipline. He returned to Mexico to accept the challenge at Mama Mia’s. His progress has been impressive. Mama Mia’s is now making their own bread, pasta, and bacon, growing their own vegetables, raising hens and chickens, and growing all of the grain for their private label beer. Hechicera, the first of its brands, made its debut this year. For the past seven years, Chef Cesar Garcia had the benefit of working with Chef Marco Cruz at La Estacion in Mexico City and now at Nomada Cocina de Interpretacion’s fine casual property, Marchanta Comedor, located in the old Nomada space on Nemesio Diez. Cesar graduated from Instituto Gastronomico Corbuse and worked as a nutritionist before he became a chef. Sous chef Izacc Montalvo Gonzalez felt the rhythm of Marcela Bolano’s kitchen from the get go. 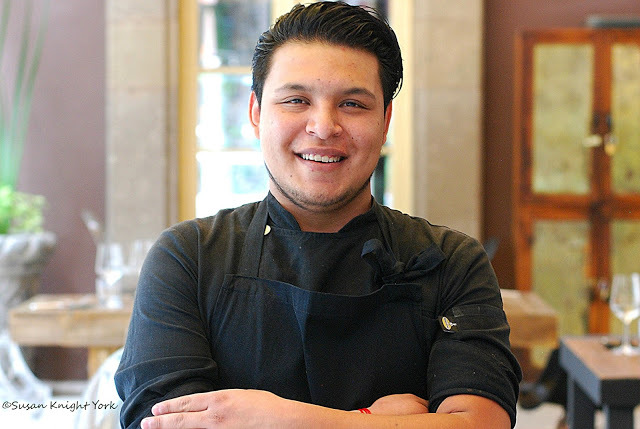 Originally from Orizaba, Veracruz, Chef Izacc Montalvo Gonzalez attended IES COLATE (Instituto de Estudios Superiores) in Orizaba and studied Gastronomy at UVP - Universidad Del Valle de Puebla. Izacc is experienced, having worked as a Sous chef with Chef Pedro Martín in Azafrán Restaurant, in Candela Romero with Chef Alejandro Sánchez, a Michelin star chef in the The St. Regis Mexico City, with Chef Manuel Baños at Pitiona, Chef Juan Emilio Villaseñor, and also with Chef Juanxo Sánchez, a judge on Top Chef Mexico. A San Miguel native, twenty three year old Chef Juan Manuel Galvin Lopez, won first place at the 2017 Chef of Guanajuato contest held at ICON University this past August. He worked for Chamonix and Hotel Real de Minas before coming to Nextia, located in Hotel Nena, to work with Chef Alonso Dominquez. Miguel is skilled in Molecular cooking, a subdiscipline of food science that explores the transformations of ingredients that occur in cooking, it’s practiced by only a few of the best restaurants. in SMA. Chef Pablo Nicacio’s resume is short but sweet. 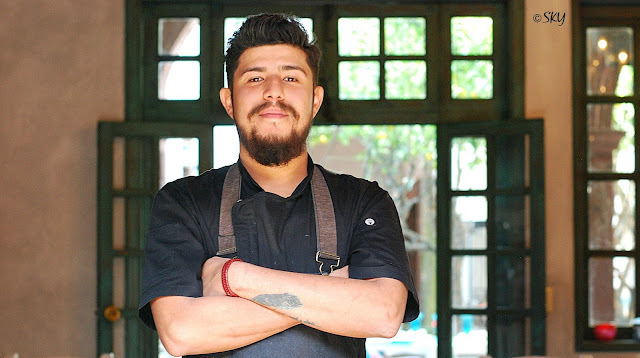 A former sous-chef for Chef Marco Cruz at La Estacion in Mexico City, B'ui cocina de campo in Otomi and Nómada Cocina de Interpretación, Pablo left to open his own restaurant, Nicasio comedor mexicano, this past fall. We think no one has earned the title of CHEF more than Pablo. 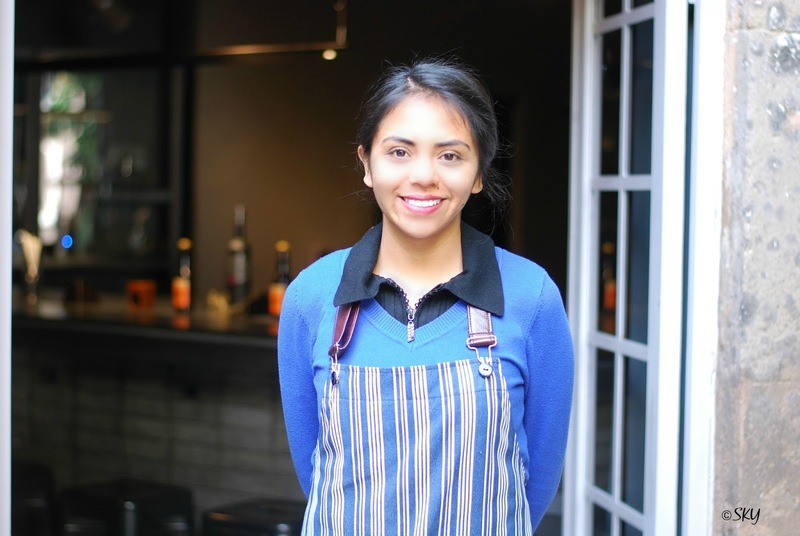 Twenty three year old Sous chef, Grecia Micaela Carrasco Chávez, has dedicated herself to the kitchen for the past seven years. 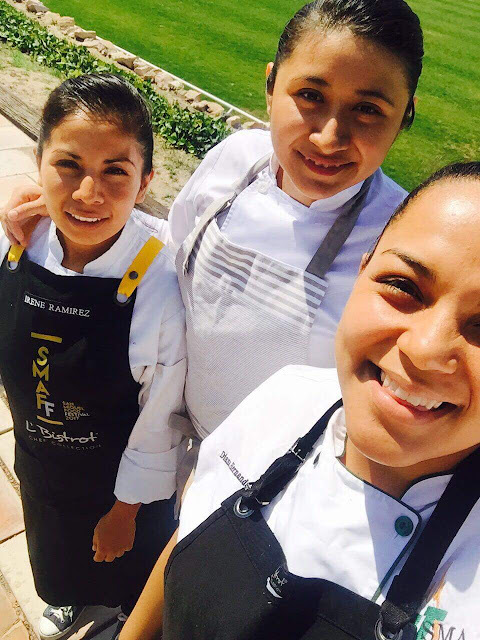 Her training began in the Restaurante Playamar Tres Cantos as a kitchen assistant. She then worked with contemporary Mexican cuisine at María-María de Altura and later did internships at the Saffron Restaurant and at the Banyan Tree Cabo Marques Hotel in Acapulco. She left the Fairmont Pierre Marques Hotel to continue her studies. Graduating from the Universidad Tecnológica de Acapulco with a Bachelor of Gastronomy, she returned to the Hotel Pierre Mundo Imperial, formerly the Fairmont Pierre Marques Hotel, in the fine dining restaurant Tabachin, which has a Four Diamond rating. 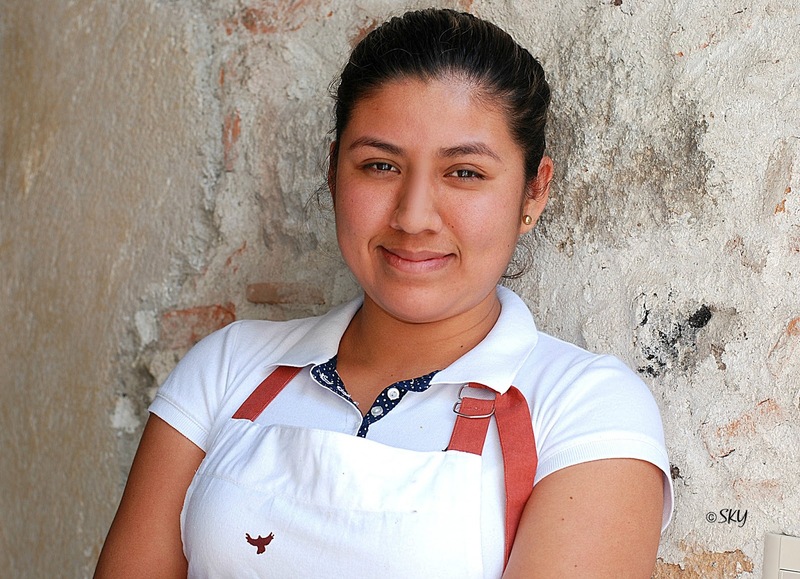 Grecia is now a Sous chef at Nomada Cocina de Interpretacion, working with chefs Marco Cruz and Sofia Antillon. Sous chef Daniel Durán García was born in 1989 in San Luis de la Paz, Guanajuato, studied at the Technological University of San Miguel de Allende and first worked with Chefs Karen Wix and Matteo Salas at Calenda. He left SMA for a short time but returned for the opening of Áperi, where he worked in pasta. 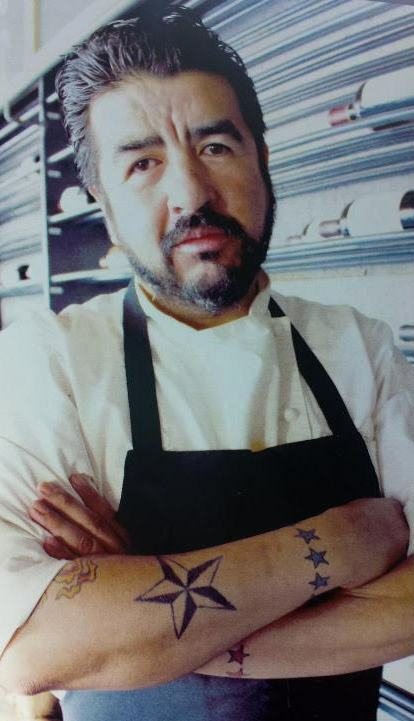 He also worked at Jacinto 1930 with Chefs Israel Loyola to strengthen his techniques and knowledge of avant-garde and traditional Mexican cuisine. He traveled to Baja California, where Chef Diego Hernandez Baquedano gave him the opportunity to work at Corazón de Tierra. Daniel is back in SMA and will help Chef Xavier Piñero open OCRE next month. Having the best Eggs Benedict on the planet has kept me going back to the new Panio Atelier Du Pain for breakfast, where I was recently introduced to this dynamic and energetic new Sous chef, Alina Stalone. Alina attended the Culinary Institute of America in Hyde Park, NY, did an externship in Aquavit and worked in restaurants in the Midwest and on the east coast to practice farm to fork dining. When she first came to SMA, she developed the menu for Sanmiguelessen, a restaurant on Stirling Dickinson, before she was hired to work with Executive Chef Ana Martinez at Panio Atelier Du Pain. Her greatest passion is working in kitchens with other empowered women. Panio Atelier Du Pain is a great place for her to start. Growing up with a father who is a chef, Armando Prats Leal, Emilia Prats learned how to cook when she was just a child. She studied at the Universidad de las Américas Puebla (UDLAP) in Culinary Arts. Now that she’s graduated, her goal is to have her own bakery, since pastry is what she loves doing the most. In the mean time, she works for her father at Prats Banquetes, which caters some of Mexico's top foods to clients around the world. With a true passion for cooking, this chef worked his way up the ranks with hard work and a determination to succeed. 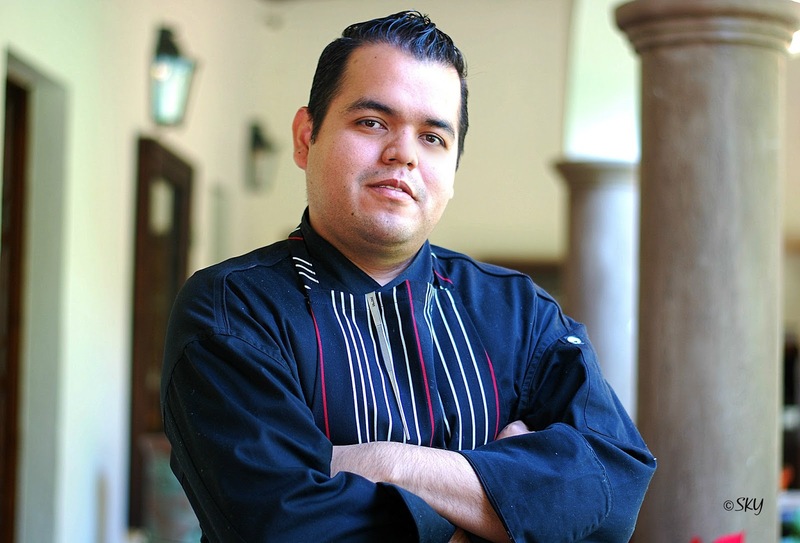 Chef Hugo Ivan Velazquez Avila was born and raised in Leon Guanajuato. At age twenty, he started working as a dishwasher in small restaurant in San Francisco, Ca., finding his way out of the dishwashing area in less than a week. He progressed from the salad and appetizer station to lead Line Cook at Pacific Catch Restaurant, later helping them to open five restaurants in the bay area. He moved to Tacolicious in San Francisco and last year came to SMA to open Taco Lab and Birdies Burgers. 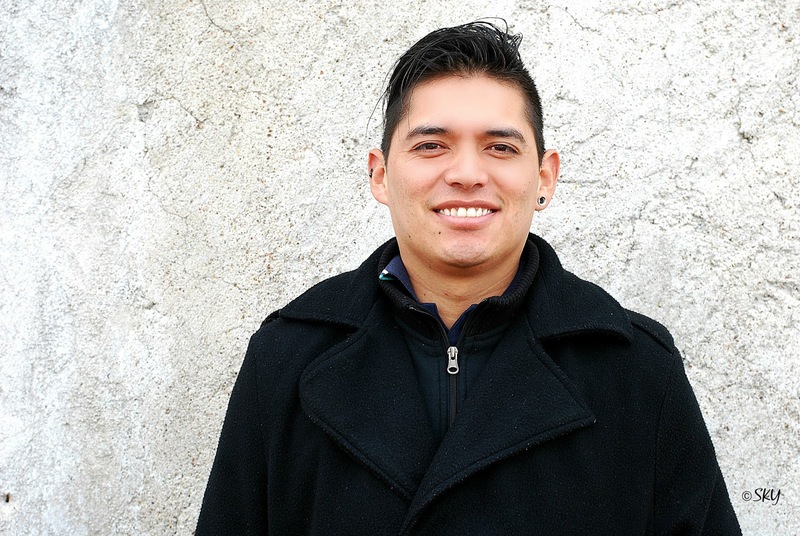 This year, he became Chef de Cuisine at The Restaurant and will help open Fatima in 2018. After studying at the University at Puebla, he did an internship in Playa del Carmen and gained experience in Thai cooking from Saffron and at Banyan Tree Mayakoba. He also did an internship at Le Chique with Chef Jonathan Gómez Luna. He helped open Passion with Chef Martín Berasategui and in the hands of Chef Máx Sola, he collaborated in Grupo Karisma with Chef Jorge Boneta at Amresort as Executive Sous chef. Last year, he was hired by Alonso Barragan to direct the kitchen at Trazo 1810. Pastry Chef Abi Verde worked as a Pastry Chef at the Hotel Matilda before coming to Trazo 1810 last year to head up the dessert menu. She’s worked with great, international chefs like Benoit Gaillot, Karen Man, Kenny Kuri and Enrique Olvera. 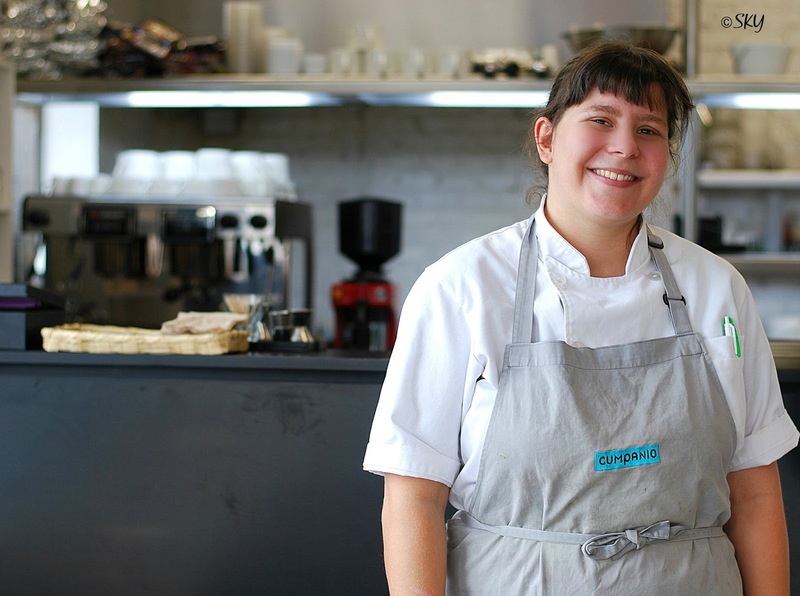 She’s one of the young, new pastry chefs to watch in 2018. 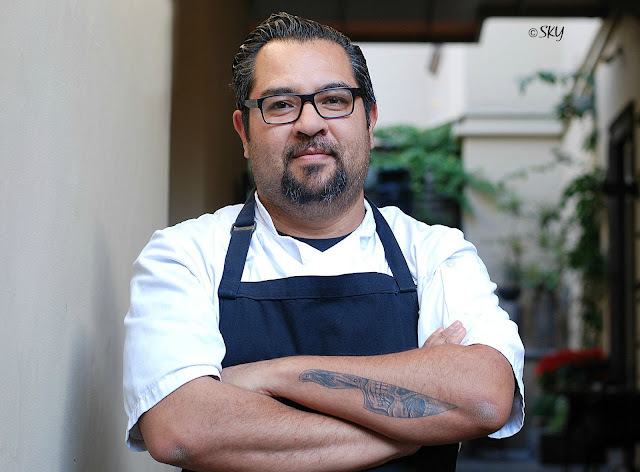 Born in Jalisco, Chef Jesus Vazquez Reyna went to culinary school in Guadalajara. 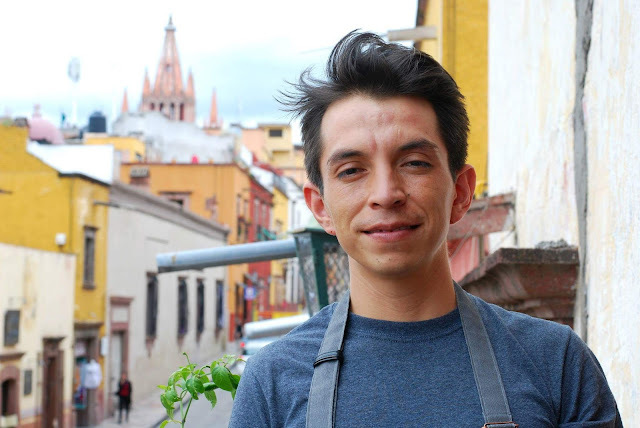 After completing his studies at ECI (Escuela Culinaria Internaciona) he worked in restaurants in Guadalajara, then in 2013, moved to San Miguel de Allende. Jesus worked for chefs Donnie Masterton at The Restaurant, Marco Cruz at Nomada and spent two years as the head chef at Matteo Salas’s restaurant, Áperi. He left Aperi to spent time in the kitchens of Chef Jonathan Gomez Luna at Le Chique, Chef Juan Emilio Villaseñor at La Cocinoteca, Chef Jesús Escalera at La Postreria and spent a season in L’astrance, a three Michelin star restaurant in Paris, with Chef Pascal Barbot. He opened Under the Table with Chef Mariana Gonzalez Gutierrez in 2018. They had their inaugural “Lucky 7” dinner at Casa Linnea, owned and operated by popular SMA chef Linnea Rufo. 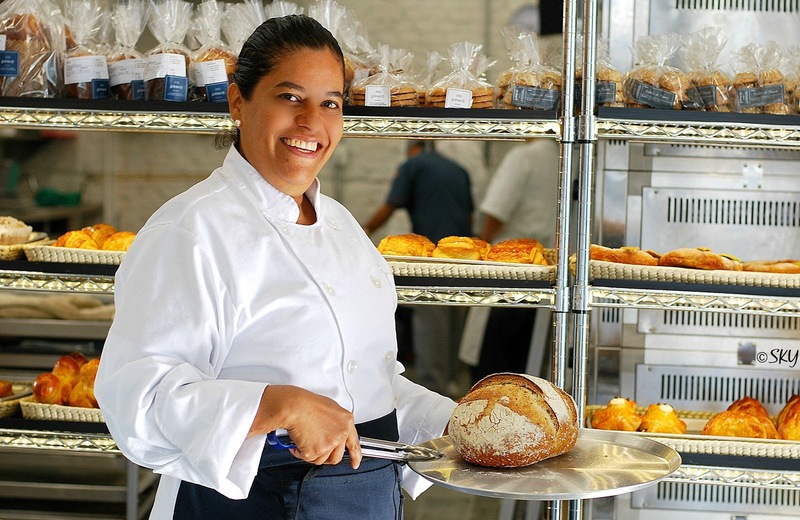 Twenty five year old Mariana was born in Tijuana, Baja California and graduated from the Culinary Art School. She did an internship at Pujol when she was just nineteen and then went to Merida to work with a group of traditional Mexican cooks. 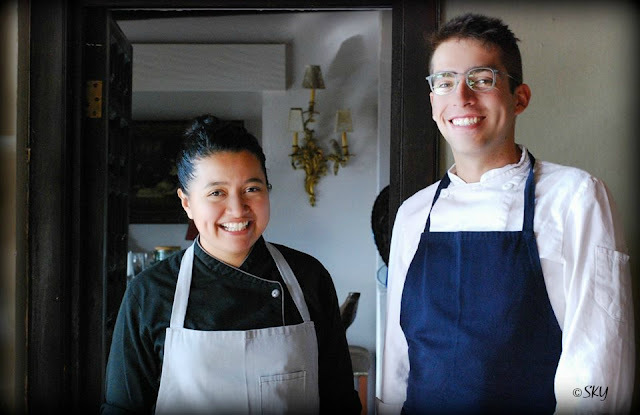 She landed in San Miguel de Allende and started working in Aperi, first as Chef de partie, and then as Sous chef. Now, Chef Mariana Gonzales Gutierrez is co-owner of Under the Table, doing private dinners and pop-ups around San Miguel de Allende. Note: Chef Jose Luis Vazquez and Sous chef Jose Cruz have joined the kitchens at San Mike Restaurante. We didn’t receive their resumes in time for publication.